Mid-Century Modernism in St. Louis. 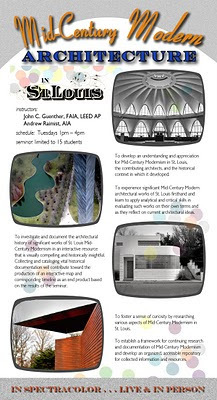 Seminar in Mid-Century Modern Architecture in St. Louis being given Spring 2011 in the College of Architecture, Sam Fox School of Design & Visual Art, Washington University in St. Louis. We will be visiting and studying excellent examples of Mid-Century Architecture throughout the semester. Students will undertake their own in-depth research of a particular building of note. Information will be collected throughout the course of our investigations in the form of drawings, sketches, photographs, videos, interviews, archival material, among other documentation. We'll be using the buildings themselves as primary sources of information and will also speak with some of the architects behind these projects and others with special knowledge of their history. One of the books we'll use as a resource will be Professor Eric Mumford's Modern Architecture in St. Louis . What are your favorite examples of modern architecture built in St. Louis between 1930 and 1970? wow! how do i join, or is it too late? do i have to be a wash u student? i thought it was cool that i unexpectedly saw you speak at the ideabounce at Railway Exchange Building...so word.